The film starts with Debbie Ocean (Sandra Bullock) attending a parole hearing. She has spent the last five years in prison, and her infamous brother Danny has recently died. Debbie says she feels she is more than ready to rejoin society and continue to live a simple life. The first thing Debbie does upon being released is go to a department store in New York City and pinch several items after pretending that she was there to return them. She then stays at a hotel after pretending to be part of a couple that just checked out. On her next stops, Debbie visits Danny's tomb where Reuben Tishkoff (Elliott Gould) appears to tell Debbie that she doesn't have to do whatever it is that she is planning to do next. Debbie also goes to find her ex-boyfriend Claude Becker (Richard Armitage), an art dealer who also snitched on her and caused her to get sent to jail. She finds him at an art gallery and intimidates him with a shiv made from a toothbrush, but she only takes a button off his shirt. Debbie reunites with her former partner-in-crime Lou (Cate Blanchett), who works at a bar where she and her cohorts are watering down vodka. Debbie lets Lou in on a new scheme of hers that she needs Lou's help on. They take a visit to The Metropolitan Museum of Art where the upcoming Met Gala is about to be held, and Debbie is planning a heist. At the same time, Lou allows Debbie to stay with her. The plan is to steal a valuable diamond necklace, the Toussaint, which is worth $150 million. Debbie wants to use snobby socialite Daphne Kluger (Anne Hathaway) as the mule so she can wear it to the Met Gala where it can be taken. First, Debbie needs to assemble a crew in order to pull this off. Debbie and Lou go to find Rose Weil (Helena Bonham Carter), a local fashion designer whose work isn't nearly as regarded as it was back then. The two find Rose crying and eating Nutella where they propose the idea to her so that she can earn herself some money. Debbie then reunites with another old friend, Amita (Mindy Kaling), an Indian jewelry maker who works and lives with her mother. She immediately joins Debbie when she tells her she won't have to live with her mom after this. Next, Lou introduces Debbie to a computer hacker who calls herself Nine Ball (Rihanna) and shows how good she is by hacking into the building's power line. Debbie and Lou then find a street hustler named Constance Wong (Awkwafina), who is a pro at pick pocketing. Finally, Debbie calls another old friend, Tammy (Sarah Paulson), who is enjoying a life with her family in suburbia, but Debbie notices that a lot of things in Tammy's garage are stolen goods. Tammy joins as well. 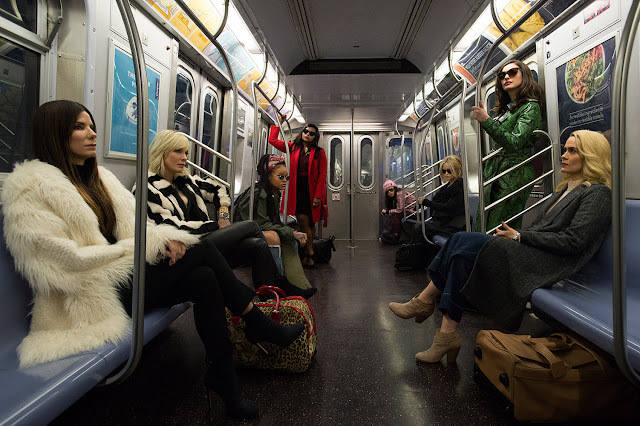 The seven women meet at Lou's loft where Debbie divulges the plan to the ladies and how they plan to infiltrate the Met Gala in order to secure the necklace, and so that each of them will have $16.5 million within three weeks. First, the ladies have Rose meet at a local restaurant with a celebrity named Penelope Stern (Dakota Fanning) to potentially dress her for the Gala. When Daphne sees them meeting in the tabloids, she sets up her own meeting with Rose so that she can dress her instead. Then, they arrange for Rose and Amita to see the Toussaint so that the necklace's owners may be persuaded to let Daphne wear it for the Gala. The ladies give Rose special glasses to wear so it can scan the necklace and send it to a 3D printer that will print a replica of the necklace made out of zirconium, which they will switch for the real necklace. When Daphne does get to wear the necklace, Rose discovers that the necklace can only be removed using a special magnet. Nine calls her sister, who knows what to use in order to remove the necklace without that particular magnet. The crew then gets themselves into the event as part of the staff, with Tammy being hired as a coordinator. She gets Constance, Amita, and Lou in as part of the kitchen staff. Nine Ball hacks into the computer of someone working the event to get a view of the seating arrangements for the event. Debbie plans to have Claude meet Daphne so that he can be her date. Lou then realizes Debbie is planning to frame Claude as a revenge scheme. A flashback shows ten years earlier when Debbie first met Claude, and they hit it off. He got her involved in a fraud scheme, and his testimony against her was what got her locked up. Debbie tries to assure Lou that the job is strictly to get the necklace. The night of the Met Gala arrives. Celebrities like Kim Kardashian, Gigi Hadid, Heidi Klum, Common, Serena Williams, and Katie Holmes (all appearing as themselves) are in attendance. The crew gets into positions, with Debbie posing as a German socialite with dyed-blonde hair and using her skilled knowledge of the German language. Daphne shows up with Claude as her date after Debbie had it made so that they could meet and hit it off. Lou adds something to Daphne's soup that causes her to run to the bathroom to start vomiting. Constance manages to swipe the necklace off her as her head is in the toilet. She passes the necklace to Amita, who goes to a staff bathroom to start splitting the diamonds off the necklace. After Daphne leaves the bathroom, her bodyguards notice that the necklace is missing. They lock the place down as they go searching for it. Before Amita can be found by a guard, Tammy pulls out the zirconium fake necklace and hands it over. Constance then gets the diamonds and hands the individual pieces to the rest of the crew before they disappear out the exits. Soon the next day, the fake necklace is discovered. An insurance fraud investigator named John Frazier (James Corden) gets on the case, as he knows about Debbie and her family's history, as well as the fact that she was spotted at the event. Frazier speaks to Claude, Daphne's guards, and the Gala's staff as they are suspects. He then talks to Daphne and even Debbie herself, to which she all but confirms that it was a revenge scheme. The ladies are at their hideout when Daphne enters. Debbie and Lou revealed they called her in because she was starting to catch on to their scheme since Rose was recording the day they found out about the magnet. Daphne is actually eager to join since she doesn't have many female friends and she finds this to be exciting. Daphne later plants evidence of some of the diamonds in Claude's apartment, which is made worse for him when four elderly women have also had valuables of their placed in his possession. Claude is sent to jail. The crew celebrates their success, but Daphne points out that stealing the one necklace and splitting it eight ways didn't sound like a great plan. That's when Debbie reveals that they stole ALL the necklaces from the Gala during the lock-down. Lou had help from The Amazing Yen (Shaobo Qin), who easily made his way through the laser detectors and helped Lou secure the items. Amita moves to Paris with a new boyfriend. Rose opens up her own dress shop. Constance gets her own place in the city. Tammy opens and operates a warehouse with more stolen goods. Nine Ball continues her hacker work. Daphne becomes a film director (and even directs Anne Hathaway). Lou gets herself a motorcycle and goes on a cross country road trip by herself. In the final scene, Debbie goes back to Danny's tomb with a martini to tell him, "You would have loved it."